As a business owner you have enough to worry about, running your business. It’s an all day task that requires your full focus. That’s why it’s unrealistic to expect you to run your business and also become a master of social media. But having a social media presence is important. Did you know that Facebook now influences 52 per cent of consumers’ online and offline purchases? We can help, because our focus is to keep on top of what works in social marketing for your business. We are Digital Marketing Consultants, not just social marketing sharing experts, so you get much higher ROI with us on your side. 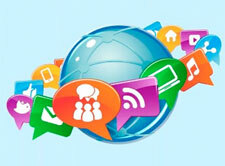 Our social media services allow you to engage with customers where they spend most their time. Our services focus on driving new customers and delivering R.O.I. for your business. And we do all the work so you can concentrate on your business. We have plans to fit almost any budget and the number of new customers you want. Let us help you make sure your business stays relevant in the digital age.